It’s that time of year again, the school year is over and the children (and their parents!) are looking for something to do. Thankfully the Saguache Public Library’s Summer Reading Program kicks off tomorrow Thursday, June 8. This year the theme is “Build a Better World!” so get ready for a season of books about all kinds of people who did just that, from teachers to explorers to songwriters. The first program will be tomorrow Thursday, June 8 from 11 a.m. to noon at the library, which is located next to Otto Mears Park. The summer reading program is free, each week sharing stories, books, and fun craft projects . Kids can expects to earn some prizes and enjoy refreshments. Together we can “Build a Better World,” this summer! For more information, stop by the library or call (719)-655-2551. 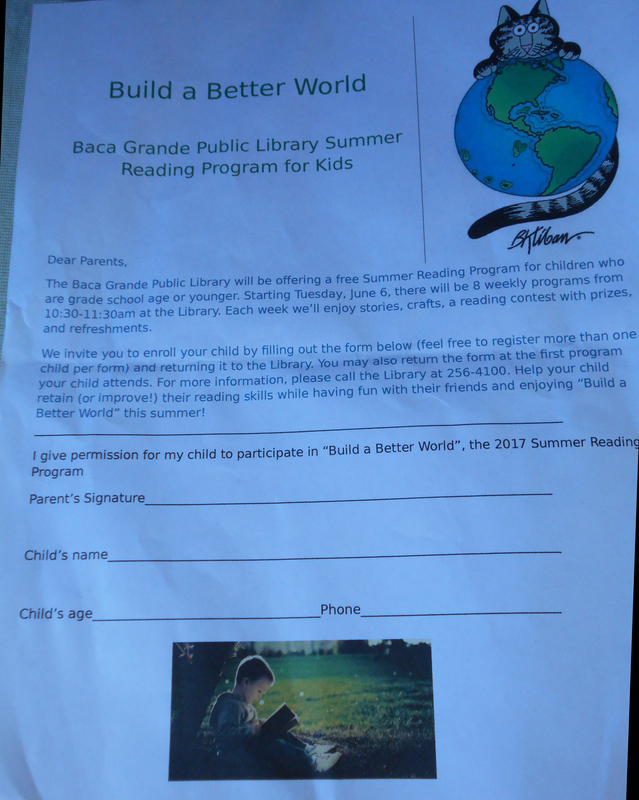 The Baca Grande Public Library will be offering a similar Summer reading Program for children who are grade school age or younger. Starting Tuesday, June 3 there will be a weekly program from 10:30 – 11:30 a.m. at the Baca Grande Library. Each week children can enjoy stories, crafts, a reading contest with prizes, and refreshments. Enroll your child, by connecting with the Northern Saguache County Library District website. Help your child retain or improve their reading skills while having fun with friends and enjoying “Building a Better World” this summer! In upcoming library news, if you or someone you know is in need of some FREE Legal advice then mark the calendar! On Thursday, June 29 (and the last Thursday of every month) is the FREE Legal Clinic at the Saguache Public Library! Private, one-on-one legal assistance with an attorney is available for low-income SLV residents who have no attorney. Legal issues that qualify: Family Law (pre-decree); Landlord/Tenant Law; Protection Orders; Consumer/Collections; Probate; and Small Claims Court. Call the library at 719-655-2551 to prequalify. Early sign-in begins at 4:30; clinic runs 5-7. First come, first served. This entry was posted in Uncategorized and tagged Saguache, Saguache church news, Saguache Colorado, Saguache County, Saguache Library, Saguache Summer Reading Program, Saguache Today, SaguacheToday.com. Bookmark the permalink.